These wild caught fish tacos were out of this world! Often times when people think of eating healthy, the number one misconception is that eating healthy takes too much time. Over the years, I have found when I think of all the things I NEED to be doing it can trigger that overwhelming feeling of - "How do I get this all done?" This is where your mindset comes in and why are you wanting to eat healthy in the first place. In reality, in any aspect of your life, if you start thinking of the NEED TO DO - it will probably cause anxiety. Instead, think about why you want to do it? What is the end result? How will the daily action help you meet a long term goal? I have found that when I plan simple, quick and healthy meals I feel better mentally and physically without spending all weekend in the kitchen. Building a sustainable, healthy lifestyle does require day to day choices but does not need to be as rigid as diet trends often portray. Some days you chop the vegetables by hand, other days you buy pre-chopped. It's summertime and I have been craving fish tacos! So, when you stumble across all the convenient ingredients, you go for it! Recently, I have started shopping at Trader Joes more often to keep some staples well stocked. Sometimes a busy life means, grabbing healthy convenience foods instead of making homemade. Right now I'm enjoying their tahini, vegan basil pesto, plantain chips, cauliflower gnocchi, and green goddess dressing to name a few! Produce is hit and miss for me personally, but I recently have found a good deal on organic cherries and blackberries. Total win! What are your most have products from Trader Joes? Preheat the oven to 350 F. If you are using frozen cod, allow it to thaw and then pat with a paper towel. 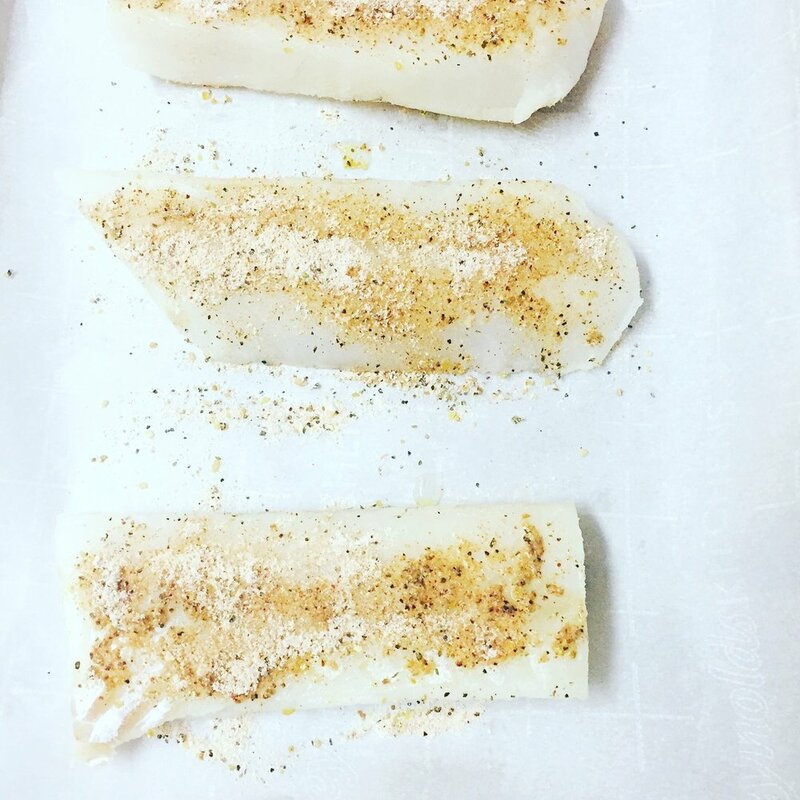 Place cod fillets on a baking sheet lined with parchment paper (for easier cleanup). Squeeze fresh lime juice over the fillets. Season fillets with a mix of Spice Cave seasoning blend, seasoning salt, and black pepper. Season to your desired taste (you may need to add a little sea salt). Bake in the oven for 15-18 minutes or until fork tender. When cod is almost done, melt coconut oil in a skillet and lightly pan fry tortilla shells. You don't have to do this, but I found I like the Siete Foods tortilla shells better fried lightly. Tortilla shells, broken up pieces of cod, shredded cabbage, fresh cilantro, avocado dressing (or Primal Kitchen ranch dressing), and fresh lime juice! Enjoy and take a bite of that goodness.